we, as young Europeans, have come together 60 years after the signing of the Treaty of Rome to stand up for Europe. We believe that it is our duty as the next generation to contribute to the shaping of our common destiny, and we invite every European to join us in this endeavour. These are turbulent times. The world around us is changing quickly and often in contrast to what we expect. In Europe, too, extreme nationalism and xenophobia are on the rise, endangering the democratic values the generations before us fought to establish. European unity is under threat. We, the young generation, see it as our duty to not only uphold Europe’s legacy, but to strive for its urgent renewal. Our lives have been shaped by the ambitious project of a politically united Europe. We are the first generation released from the political divisions of the Cold War and from the harsh confrontation with our neighbours. We have experienced open borders and easy traveling, a single currency and common citizenship, education exchanges and new technologies, all of which have allowed us to meet other Europeans and concretely enhanced our conviction of belonging together. 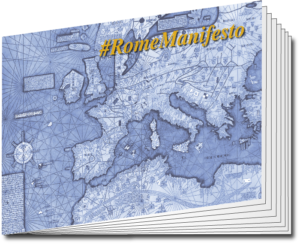 This is why with this Manifesto, we wish to set out how we see our future together: how our common identity is shaped; why we need European integration; how we can put people at the heart of the European project and what concrete institutions and procedures we propose for our European Federal Union. If we wish to live together in peace, prosperity and solidarity under one roof, we must understand what it means to be European: we can take pride both in our own country and feel at home in the rich diversity of other European countries, cities and regions. These components exist in harmony and are not mutually exclusive. European identity is a mosaic, rich and colourful due to the diversity of its pieces. This diversity cannot be lost without losing the essence of the mosaic itself. As the Greek myth of Europa shows, migration flows have always been a part of it, both challenging and enriching our identity. Everyone can be European regardless of one’s place of birth and can contribute to the shaping and to the future of the European project. Our identity is neither static nor monolithic; it evolves as we meet and speak with others. Being European means to be an active part of a broader community, facing common problems and embracing a common destiny. We do not need to learn to be Europeans, we just need to recognize that we already are. Our identity is built on reconciliation after terrible wars and cruelties. Our history binds us together as does geography. Ancient cultures and religions – the Greek and the Roman, the Jewish, the Christian and the Islamic, the Germanic and the Slavic – have produced an extraordinary legacy of literature, sciences, arts and music. The peaceful coexistence and mutual acknowledgement of different faiths are crucial for our future. Humanism, the enlightenment, rational and critical thinking have contributed to separating the roles of politics, law and religion within society. Today a set of shared beliefs defines our common good. Freedom and democracy constitute the foundation of European societies and cannot be unbound from respect for the rule of law. As outcomes of modern European political thinking, liberalism and human rights have provided the ground for the post-war reflection on equality, social justice and peace. After World War II, Europe embarked on the path of integration because nationalism had brutally failed. The European project, as proposed by the French Foreign Minister Robert Schuman in May 1950, promised peace and prosperity to European nations willing to pool their most important resources. This unprecedented approach was richly rewarded: European integration has delivered beyond expectation on its promise of peace and prosperity. Yet today, Europe’s achievements are mostly taken for granted and the old vision is fading. The European Union’s institutions are weakened because people consider them incomprehensible, bureaucratic, and lacking in democratic legitimacy. They have been unable to support Southern Europe in overcoming the economic crisis that has hit the younger generation particularly hard. Nationalist movements reject the idea of finding common solutions to common problems. We disagree. We believe that Europe is needed more than ever to safeguard our security and prosperity. European unity and solidarity are the only rational answers to the challenges of our age, from climate change to migration, from rising inequality to digitalisation, from terrorism to the threat of war. European integration must move forward on new grounds because only together we can work towards a better global order. This is why we propose a European Federal Union that puts its citizens at the centre and focuses on protecting and serving them. Every person has the right to freedom and dignity. The Federal Union promotes and safeguards the principles of democracy, the rule of law, and human rights. Every person has the right to live safely and free of fear of physical harm. The Federal Union protects people in its territory from internal and external threats to their security that cannot effectively be addressed at the member state level. Every citizen of the Federal Union has the right to a productive life anywhere within the Federal Union. The Federal Union ensures the free movement of people. It fosters prosperity and job creation by providing a fully integrated single market and a European level playing field. Every citizen of the Federal Union has the right to enjoy equal opportunities in terms of education and receive social protection to cover basic needs. The Federal Union is committed to social justice and the fight against unfair inequalities, exclusion and especially youth unemployment. Every person has the right to a clean environment. The Federal Union, acting also in the interest of future generations, protects the environment and promotes an efficient use of natural resources. The European Union today has a complex institutional architecture which is difficult to understand by the citizens, and fosters distrust vis-à-vis the EU. The current system of governance based on intergovernmentalism is unable to address the challenges facing Europe in an effective and transparent manner. We therefore call for a new constitutional architecture, designed to simplify Europe’s form of government and improve legitimacy as well as accountability. We believe that only an institutional regime endowed with clearly defined competences, and legitimated through appropriate democratic processes, will win the support of European citizens. We hold a Federal Union to be a system with clear separations of powers, vertically between the Union and its member states, and horizontally between the institutions of the Union itself. Vertical separation of powers will be achieved by neatly dividing the competences of the Federal Union and the competences of the member states. Sovereignty will be divided between the Union and its member states according to the principle of subsidiarity. The Federal Union shall have competence in foreign affairs and immigration, counter-terrorism and defence, the internal market, competition and trade. It will have a common currency and a fiscal policy designed to ensure the proper functioning of the economic and monetary union. The Federal Union shall not be a super-state. It will refrain from overly intrusive regulation. Any competence which is not explicitly delegated to the Union shall remain with the member states. Moreover, some competences which are currently exercised at EU level can be repatriated to the member states. Budgetary powers shall be divided between the Federal Union and its member states. The Federal Union will have a reasonable budget financed through taxation and not through transfers from member states’ budgets. The member states will be independently responsible for their budgetary processes and for the service of their debt according to the no-bailout rule. Horizontal separation of powers will be achieved by clearly distinguishing the functions of the various Union institutions. As required by principles of constitutionalism, the institutional system of the Federal Union will be based on a legislative, an executive and a judicial power. The legislative power of the Federal Union will be divided between the European Parliament and a European Senate – which will result from the merging of the current European Council and the Council. The European Parliament, directly elected by the Union’s citizens through a uniform electoral procedure, will act as the house of the people. The European Senate, composed of members of national governments, will act as the house of the states. Every piece of Union legislation, regardless of the authority initiating it, shall be approved both by the European Parliament, voting by majority, and by the European Senate, voting by qualified majority. The executive power of the Federal Union will be vested in a European President elected through a democratic process. The President will represent the Union in international affairs and head the European administration evolved from the current European Commission. In fields where neutrality is required such as monetary policy or competition, independent agencies will be established. The judicial power of the Federal Union will be exercised by the European Court of Justice, which shall be entitled to review Union legislative and administrative acts for compliance with the separation of powers and the existing Charter of Fundamental Rights. The European Court of Justice shall ensure the uniform application of Union law and its supremacy over state law. In order to prevent the break-up of the European project and to move forward with integration, we propose to draw up a constitution defining in clear and binding terms the powers and governance structure of the Federal Union. This constitution shall enter into force when a majority of today’s EU member states have ratified it through a dedicated procedure. The Federal Union will welcome any European country sharing its values. Countries which do not ratify the constitution will not be members of the Federal Union, but the Union will associate them as closely as possible. Member states of the Federal Union will not be allowed to obtain opt-outs. The institutions of the Federal Union are empowered to enforce compliance by the member states with the principles and values which are enshrined in the Union’s constitution. To ensure speedy adoption, we invite national parliaments to appoint at the earliest state delegates who shall meet in Rome in 2017 to draw up a constitution of the Federal Union reflecting the principles spelled out above. As the young generation of Europeans, we are convinced that change is necessary and possible. Standing on the shoulders of giants, we are not afraid of claiming that the true European spirit is democratic, tolerant, pluralist and cosmopolitan. Now, not tomorrow, is the time to show that we can build our house on stones so solid that it can withstand any storm. Your Email address will not be published. We will use it for a confirmation email only.